Yet another entry into the 3-D graphics game foray, QBall is an interesting variation of pool. Imagine, if you will, a pool table constructed as a cube within which the law of gravity has been negated. In other words, rather than playing on the surface of the table, the balls move around in the air contained within the cube. There are eight pockets, one in each corner of the cube, and if you think learning to play conventional pool is tough, wait until you get a look at this. To make matters even more complicated, you may set the amount of spin on the cue ball, the amount of force with which you'll strike the ball, and the friction of the air. You may also take your shot in the "real" or "Planer" modes of play. 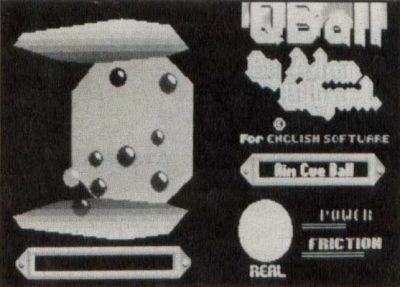 The former is the 3-D mode where the balls can move in any direction within the cube. The latter forces the balls to "roll" within a single plane. You may view the cube from any angle by adjusting its position with the arrow keys. Even with this ability, however, setting up a shot is a frustrating and confusing bit of work. You use the aiming keys (the numeric keypad) to position a marker that shows the point at which your shot will strike another ball or the walls of the cube. To say that this perspective is confusing is a gross understatement. It would have been so much better if the aiming was done by rotating the cube from a single viewpoint—that of the cue ball—thus allowing you to see the table from the cue ball's position. The two-page manual isn't going to give you much help either, since it does a poor job of describing the game's mechanics. For instance, it states that to begin the game you must choose a one- or two- player game. I spent the first 10 minutes with the game trying to figure out why the 1 and 2 keys on the regular keyboard didn't respond. I thought I had a bad copy of the game until I discovered—purely by guesswork—that you have to press the number keys on the numeric keypad. The graphics are simple, but well done, giving the player believable 3-D movement of the balls. The frustration level of the game, however, is a bit higher than many people may be able to tolerate. It seems most shots are made purely by luck, especially considering the game's timer doesn't allow you to spend as much time as you might like setting up your shot. Recommendation: Get a demonstration before you buy.